I love fashion accessories of all kinds, especially purses and handbags! I'm the type of gal who feels lost without carrying a purse and have to admit that I currently have most of a closet in my home overrun with handbags. I feel that handbags are like shoes in that having the perfect ones can really make or break your entire outfit. If only there was a way to save your closet space (and your money) by being able to create different looks with the same purse. Well, Luvali Convertibles has come to our rescue by creating reversible handbags and slips in a myriad of fashionable prints and designs! Keep reading to find out more! I reviewed the Blue Suede Shoes in Chocolate Classic Convertibles Handbag from Luvali Convertibles, which retails for $80.95. 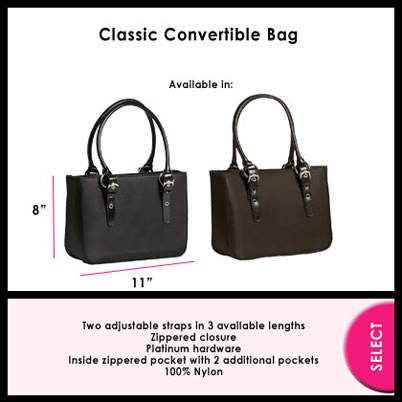 Luvali Convertibles has made it super simple to create 3 COMPLETELY DIFFERENT looks with just ONE handbag! I had the opportunity to review one of their classic convertible bags, which is an 8" x 11" nylon handbag with two adjustable straps. You can select either a black or a brown base bag. Personally, I have a lot of black purses, but really needed a classic brown handbag. After you've chosen your base bag, next you get to choose one of the designer slips which will transform your classic handbag into two other unique styles. Upon viewing the custom slips, I immediately knew I wanted the Blue Suede Shoes in Chocolate, shown below. How adorable are these two patterns? 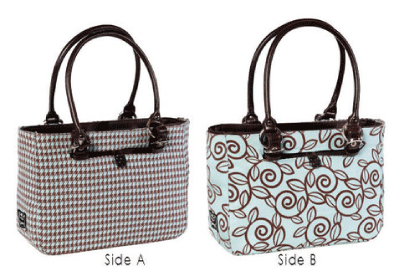 One side is a blue and chocolate brown houndstooth pattern, while the other side is a beautiful blue and chocolate swirly floral pattern. Since I'm a pretty laid back dresser most days, I just knew this reversible slip would complement my denim wardrobe wonderfully. I was so amazed at how easy it was to change the look of my purse! Simply unzip the zipper on the side of the slip and completely remove the slip, revealing just the base bag, or flip the slip inside out thereby showing the other pattern, put back on your base bag and zip up again. TOO EASY! Three completely different handbag looks for the price of just one purse! If you have a woman on your Christmas list this year who absolutely loves handbags, why not buy her one bag with three completely different designs? This is a wonderful idea for it saves money, by not having to purchase three separate purses, and saves closet space, by not having to store three separate purses, too! For only $24.95 each, you can also purchase additional slips which will give your classic handbag two completely new looks. Now you can easily change your handbag to match your mood or the season and easily suit your style of the moment. Change your PURSEonality this holiday season! Disclosure: I received the Blue Suede in Chocolate Classic Convertibles Handbag from Luvali Convertibles in order to facilitate my review. No other compensation was received. This product review is based on my own personal experiences with this item and is completely honest and objective.